"it didn’t matter...as long as we were doing it together." We reached the top, what felt like the top of the world. But in reality, it wasn’t even the top of that zip code. It was beautiful, glorious. I got to see the Continental Divide, where all the rain fall and snow melt on the west of it flows to the Pacific, and all to the east flows to the Gulf of Mexico and the Atlantic. We had five hours to climb and reach the top, about 15 minutes at the top to observe and about three hours to reach base camp. As we began to decent the top of James Peak I started feeling a sharp pain in my heel, those hot spots I spoke of earlier had ripped open. I couldn’t feel them before because of the way I was hiking, slow and up with little to no movement of my ankles. But on the way down, I began a much more aggressive approach. My heels the whole time have been moving in my boots, so the pain began. I quickly realized that 99% of climbers think the climb up is the easy part and the downward trail is the more difficult. The constant slam of your joints, the compression on your back, the rolling of your ankles due to a rock or a misstep. I finally reached camp with a quick sigh of relief. I’m down. It’s over for the day. That was amazing. All of this is running through my head as I’m taking off my boots. My socks are dried to my feet, crusted blood fused to my heels. As I ripped off my socks revealing half dollar sized blisters, and all I could think is that I have a new mistress and her name is Altitude. Walking around camp showing off the battle wounds, and waiting in anticipation for the next climb wondering if it’s going to be as hard or harder than this one. The next day was the hardest part of the entire trip. I had to put socks back on over my ripped blisters and walk down the rest of the mountain knowing that all I’m doing is going back to the vans. Back to reality. Don’t get me wrong, my life is great, but I had just tasted something special. Needless to say, I would be dreaming of the next climb. After getting home, the high was gone and it was just me again. I started to think that I didn’t enjoy sitting at home or going to the gym, walking around with Amaleah in our small town of Fairfield, WA. But I knew that I was going to be given a chance to climb again, and I was still excited for that. The start of the second trip was great. In fact the whole trip was great, from the beginning at the airport in Denver I was greeted by the USO and team members/leaders. The feeling of not enjoying the climb was washed as soon as I saw the members of the team. While we were driving to the hotel they said we would be climbing Elk Head Pass in the Collegiate Mountains. I was so excited to get moving and start the next chapter. 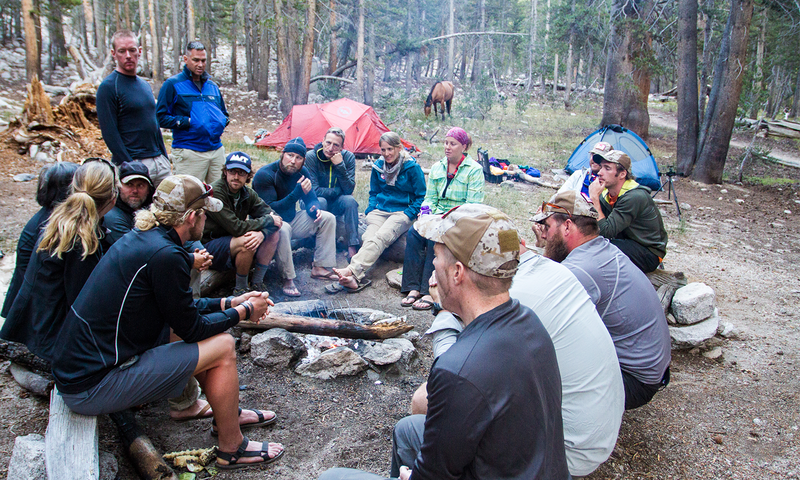 Before we began the climb, we stayed at an Outward Bound Course outside of Leadville, CO. We got to do certain team building exercises, and let’s face it – we needed that. Not that we weren’t a team or that we didn’t move as one, but we needed to remember what a team exercise was and what it was about. We had to learn to let go of one self and rely on the man or woman to the left and right of us. I can’t thank enough the guys and gals in Leadville that helped us through the outward bound course. Team building complete for the time being, we were ready for the accent.As we geared up for the climb we learned that not all can carry the same load. We knew right away that some would have to climb with more, and we were okay with that. This trip was going to be 20 miles in two and half days, a fairly large leap from the short eight mile round trip from the first trip we shared together. Back at home I had changed my training ever so slightly to allow for a more relaxed climbing experience, i.e.. more and more stairs at the gym. There’s nothing worse than having to stare at yourself in the mirror watching sweat pour from your head and soak everything below. Back to the trip. It was even more enjoyable than before, new shoes so no blisters. Better shape so I could enjoy everything around me so much more. And I was even staying close to that fast group, some of those crazy athletes I was speaking of earlier. I’m not saying that I stayed with them even for a short time, but I’m saying I proved to myself that I still had something left in the tank. At the end of the first day I was tired and thought rest was much deserved. We stayed close to an old cabin along the trail that at one point held strong for live stock, and mountain life. Nowadays, I assume, it’s for tired horsemen, and hikers alike. The second day we climbed higher and higher on the trail, following one after the other. Moving too fast to catch every little thing, but still slow enough that the things you would see you wouldn’t soon forget. That night we camped around 12,000 feet. The sights of the area I can’t possibly explain. It felt like something out of a story book, some special lost land, or a time long before us. The clouds began to form and the wind began to howl and that special place began to take a different look. Not bad, just not the same as a sun kissed forgotten space in the fast paced world we live in today. Hail, lighting, thunder, and rain began to fall on us as we were 1,000 feet above tree line. Nowhere to go nowhere to hide from the elements except for our tents. Three fully grown men in one tent regardless of the manufacturer specs is not enjoyable, but in all honesty I couldn’t think of a better place to be. We cooked dinner in our tents that night around 4PM, and went to bed shortly after. Hard to sleep at such a high elevation, really hard to sleep at that elevation for 12 hours. Around the same time, one of my tent mates and I both woke up. It was maybe 3AM. The sky was both as crystal clear and as black as anything I have ever seen before and the stars – oh, the stars could light a stadium. I have seen the night sky in different parts of the world but this was truly remarkable. The next morning, with everybody refreshed, I sat there with a headache that for the life of me I couldn’t seem to shake. Meds no good. Water? No, sir, I had plenty. Finally, what stopped it was simply moving around and building the oxygen back up in my body. As we topped the pass, we started our accent just as fast as we started up. As we moved down through the trail, switchback after switchback after switchback, we began to move into the tree line once again. My breathing became less labored, my body began to gain more strength. Oh how that fickle mistress, Altitude, can way on you. But you continually seek her. We made it to the bottom, this time all of us happier than the first accent on James Peak, which was almost twice the length as the first trip but much more tiresome. We were slowly getting ready for the monstrous six day 45-mile climb to the highest point in the lower 48. Three weeks had passed since we all were together in Colorado for our climb through Elkhead Pass. Three long weeks had passed since I had gotten to see my team. Back at home I felt ready, mind, body, and spirit. All three were equal all three were hungry. I began my journey a little softer, a little weaker, a little less sure about one self. By now that has all gone. I’m not saying I am a figure model or a world champ Strongman, but I am harder and stronger than when I started, thank you Stairmaster! We began with high fives, and hell ya’s but we quickly turned to game mode as we began our drive to Onion Valley. There, we would assure ourselves that our gear was solid and that our food was plenty (something ridiculous like over 50 blocks of cheese). We started the climb, which took me about an hour or so to fully warm up while hiking. I thought the switchbacks on the last trip were endless, but it seems like that’s all this trial is. Switchbacks for hours in the beginning, middle and end. Switchbacks in your dreams if you’re not too careful. Within hours we were standing at the top of Kearsarge Pass, 11,760 feet. The fact that we made it that far up that fast I was happy. But I soon realized that we would be going up and down in elevation for days building the red blood cells up in our body so we can make the finale assent with ease so I needed to be ready to go down after camp. It was my first time camping in an area where you have to have bear boxes. I wasn’t scared but at the same token it was a little uneasy; I was hoping that everyone put their food, snacks, candies and basically anything that had a smell to it away. The night was great. Good food, lots of cheese, corn on the cob, steaks, and watermelon. You wouldn’t think we were on a 6-day camping trip. There were four teams and five event. First up was hacky sack; everyone on the team had to kick the sack without it hitting the ground. Next, we had to run to a high altitude lake and retrieve pieces of a tent from the other side. You could either take the shorter path and swim across or walk around the lake to grab the tent poles. I choose to swim figuring it would bring more laughter to all of the group. I ripped off all my clothes, leaving on only my skivvies, and walked into the water. It honestly was as cold as I thought it would be. After getting the tent pieces to my teammates waiting, I moved to put my clothing on while they set up the tent. Once the tents were built, we had a few more challenges: finding a heart shaped rock, hitting a bottle with a frisbie from ten yards out, carrying an 80-pound case a couple hundred yards and finding an object – i.e. a flag using a compass. I should have paid more attention in land-nav. We ended up in last place because of the compass portion and I felt bad for my team and for myself. I Hate losing, but we ended the night with good stories, great food and lots of cheese. The next day was the accent for Forester Pass and a 36-hour cell came in and we were getting wet. My shoe for example, somehow made its way out of the tent just a hair and with an all night drip after endless drip, my shoe was filled with water. HELLO wet foot, I had to set it next to the stove for what seemed a lifetime hoping it would dry. I got it the best I could and geared up. Moving back up the pass with the dreary weather brought a different feeling. Slower movement, wet, cold weather pressing down on you. You had to stop to put more layers on and stay warm. Slowly but surely, we all made it to the top of Forester Pass. On the way down from Forester we got to experience hiking alone for a few hours. The leaders let us go one by one roughly every five minutes down the Pass. One by One, alone and silent, listening to only your own thoughts. It was a great meditative time. When we finally reached the grouping point people seemed to be humbled by the time spent alone. We were either tired from the journey that day or dwelling on what we were thinking. I would like to say the latter, but I’ll let you take that journey and figure it out for yourself. We only had about a half mile to the campsite and it was right along a beautiful mountain lake. When we arrived, we all were skipping rocks excited for the days end. Meals were becoming better and better with each passing day, and boy did I learn to love cheese. Towards the end of the day some of us had gone to bed and others decided to play a few stupid games, but a mix of lack of sleep, and a stronger build of comradery it didn’t matter what the game was as long as we were doing it together.